Etienne Leenders French stable: Noticeable first time out. 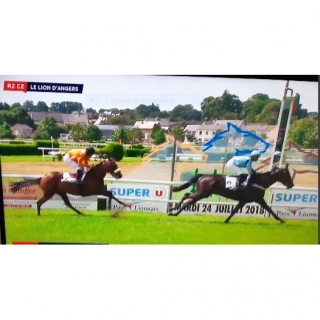 On July 24th at Lion d’Angers, FLEUR DE L’AIR ran first time out in Prix de l’Aubinière, a flat race for 3 year-old AQPS (non-thoroughbred) over a mile and a half. Ridden by Adrien Fouassier, she started in 3rd, 4th position and at the entrance of the finishing straight, she found an opening and performed a very nice finish. This lovely filly has a nice future. Her pedigree: she is by Buck’s Boum out of Fille de L’Air…She was bred in Nièvre by SCEA Château de Favray and Jean-François Bedu.